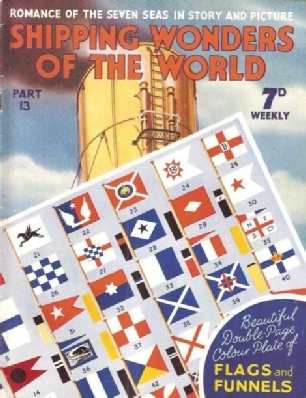 Part 13 of Shipping Wonders of the World was published on Tuesday 5th May 1936. 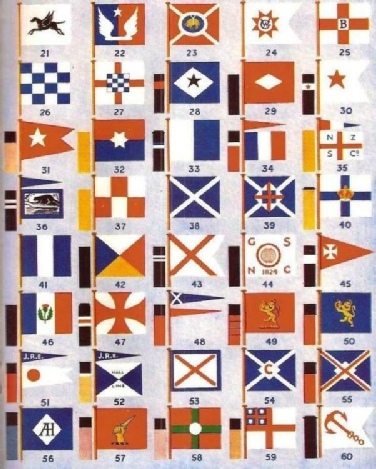 This issue included a double-page centre-spread colour plate illustrating “Historic Flags and Funnels”, part of which is shown on the cover design. The plate accompanied the article on House Flags and Funnels The coloured plate was inserted between pages 404-405 of this issue. The cover shows a ship’s funnel partly overlaid by the second page of the colour plate included with this issue. Ralph Stock, a famous author, his sister and a friend sailed a 47 ft yacht from a port in Devon to an island in the Pacific and thus accomplished an outstanding feat of navigation. The article is by Sidney Howard and is the third in the series Great Voyages in Little Ships. The opening of the Panama Canal introduced many new trade routes, in particular that for the carriage of merchandise between the Pacific Coast of North America and the United Kingdom and the Continent. This route has grown in the last few years, and special vessels have been built to carry the grain and lumber of the northern ports and the fresh fruit of California. The Canada, one of the latest of these dual-cargo ships, is one of the most powerful single-screw ships afloat. This is the eighth article in the series on Merchant Ship Types. Why the application of the rotor to ship propulsion, after having proved satisfactory, did not remain long upon the high seas. The article is by Frank Bowen. Though a spectacular attempt to cross the Antarctic Continent on foot did not succeed, Shackleton’s 1914-1916 expedition was a triumph of bravery and endurance. The article is by Lieut.-Com. R. Gould and is the fourth in the series Epics of Exploration. This chapter is concluded in part 14. There is an article on Shackleton’s earlier Antarctic Expedition in parts 1-2. Concluded from part 12. You can read more about this salvage in chapter VI of David Masters’ book The Wonders of Salvage. 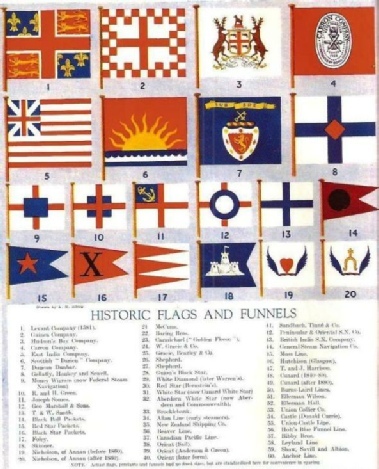 The fascinating story of historic house flags and funnels by Boyd Cable. In this article he describes the many-coloured devices and coats of arms which merchant vessels have borne throughout the history of maritime trade. This chapter deals not only with the flags of modern steamship companies, but also with those of the pioneers of merchant shipping. Much of the material of this chapter has not been published previously, and is the outcome of long and extensive research by the author. (20) Nicholson of Annan after 1860 (left-hand page, lower right); and from (21) the McCunn Company (right-hand page, top left) to (60) the Anchor Line (right-hand page, lower right). The illustration is by K M Sibley. The “shell-back” - or forecastle-hand of sailing ship days - was a product of the conditions in which he worked and lived. He was hardy and courageous by nature, and the circumstances of his life made him accept extreme discomfort with comparative indifference. This chapter is by Frank Bowen. A first-hand account of a trip in the English Channel and North Sea in a battleship engaged on peace-time manoeuvres. The Navy Goes to Work.